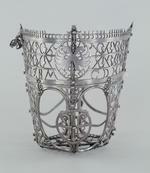 Made of steel and finely pierced and decorated with a delicate openwork pattern of scrolling tendrils which form a wide horzontal band at the top, two vertical bands at the sides and a central panel at the bottom. 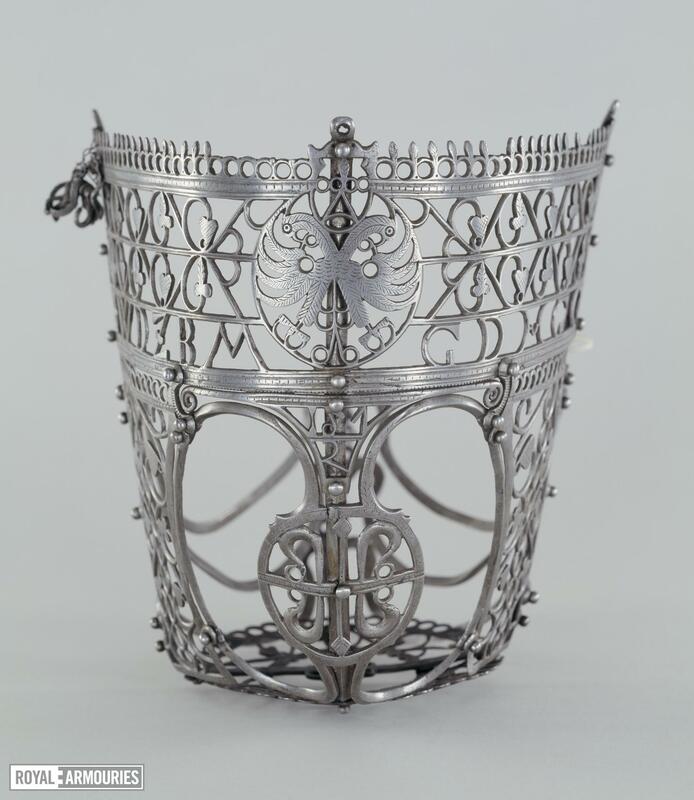 The upper band has an Imperial eagle at the centre, with the letters IWDZBM and GDHGG at either side. Below this is the date 1572 and below this a fleur-de-lys. A.R. 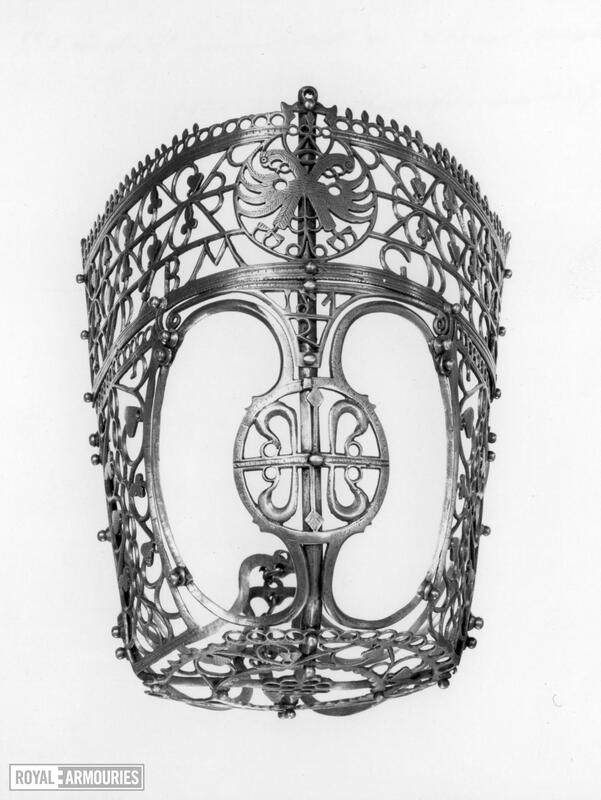 Dufty and W. Reid, European Armour in the Tower of London, 1968, plate CLVIII. The fleur-de-lys is probably arms of the Welser family, party per pale a fleur-de-lys counterchanged argent and gules. Several members of this influential merchant family held government and municipal offices in Augsburg and Nuremberg in the 16th century. The inscription can be read as Johannes Welser der Zeugamts bestellter Meister (or der Zeit Burgermeister); Gott der Herr gebe Gnad (Johannes Welser, appointed Master of the Ordnance Office (or at this time Mayor); may the Lord God give him Grace). Johannes was the son of Anton Welser and nephew of Bartolomeus, the most significant of the Welser family in the 16th century, an advisor to Charles V by whom the family's arms were granted in 1522. 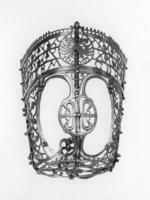 The fashion for horse muzzles was short lived; many are dated, and most of the dates fall between 1552 and 1621 (Chodynsky 1987). They were also very restricted geographically, the majority coming from Germany, mainly Styria, Carinthia, Bavaria and Saxony. Very little is known about their use. Though they still feature as part of traditional Bavarian horse harness today, they are mentioned in hardly any equestrian manuals, and there are hardly any illustrations of them in use. Another very similar example was sold Oxenham's, 21 July 1842, lot 263 (ill). Another, dated 1564, sold Christie's 25 June 2013 lot 35.